Pharma Nord is one of Europe’s largest manufacturers of products with essential nutrients. We develop, manufacture and market scientifically well founded dietary supplements, herbal remedies and medical drugs based on optimal bio-availability, safety and documentation. The products are tested actively in scientific research and to date, more than 300 scientific studies involving Pharma Nord's products have been published, including the sensational Q-Symbio and KiSel-10 studies that show how effectively you can use coenzyme Q10 and selenium for treatment and prevention. Pharma Nord’s research database contains more than 9,000 scientific studies - including all the studies conducted with Pharma Nord’s own preparations. The database is the cornerstone of the entire product development. Pharma Nord manufactures all of its products in Denmark and is subject to the restrictive Danish laws. Because Danish legislation is highly respected by markets abroad, Pharma Nord has chosen to meet the increased demand for its products by expanding its Danish production facilities in Denmark, instead of moving part of the production to other countries. Pharma Nord’s products have become a well-known brand in many countries, particularly because of the characteristic design with its well-known "quality beacon", the golden mortar and its "peep-hole" to the products inside, the exclusive, gold-rimmed boxes and the uniform Bio-concept. Consumers, retailers and health professionals associate these traits with thorough research and a high level of bio-availability and safety. These virtues are what make Pharma Nord’s preparations viable in a market that is often ruled by trends. In fact, this is what prompted the international Superbrand Council to nominate Pharma Nord "Superbrand 2007" within the Business-to-Consumer market. Pharma Nord and several other branch colleagues have established Nutraceutical Industry (NI), an association of leading nutraceutical suppliers. The primary task of NI is to bridge the gap between the two sharply separated sectors for pharmaceutical drugs and food. This is done by engaging in a constructive dialogue with authorities, experts and consumer organizations on matters relating to the industry's development and image. Sven Moesgaard, Pharma Nord's technical director, was Nutraceutical Industry's first chairman and still sits on the board. Pharma Nord was founded in 1981 by the two current owners, Eli Wallin and Sven Moesgaard, who established an import of a British selenium product. Soon after, the product was developed additionally and became the product that is known today as Bio-Selenium+Zinc® and is still a cornerstone of the product range. The underlying idea of Pharma Nord was to compensate for the shortcomings of modern diet by means of dietary supplements with good bio-availability and a documented effect. Bio-Selenium+Zinc successfully embedded this philosophy in a single product and paved the road for the first daughter companies that were established in Sweden, England and Finland. Over the years, Pharma Nord has earned a reputation as an innovative and visionary player on the nutraceutical market on several occasions. Phama Nord was the first company to introduce coenzyme Q10 to the European market. Its product Bio-Quinone Q10 was launched in 1990 and has grown to become one of the leading Q10 products worldwide. This is just one of many examples showing how Pharma Nord has spearheaded the market by chanelling new knowledge into new products. Pharma Nord is an atypical company in the dietary supplement industry in that all products - including dietary supplements - are produced according to both cGMP (current Good Manufacturing Practice) as well as in accordance with the guidelines for medical drug manufacturing. This higher production standard creates a number of advantages for Pharma Nord and for our customers. Customers benefit from the control mechanisms & requirements that are incorporated in pharmaceutical production, requiring documented uniformity, safety and efficacy. For Pharma Nord this means that doctors, researchers and other healthcare practitioners trust our preparations and choose to use many of them in scientific studies and recommend to their clients as well. Therefore, the same preparation can be found in a number of countries, both as an OTC dietary supplement and as a drug - some times marketed under different product names. Pharma Nord's products are now sold in 45 countries. Pharma Nord's decision to produce medical drugs and dietary supplements to the same pharmaceutical standard and as far as possible to document the effect of the preparations through scientific studies has been successful and has gained worldwide recognition. 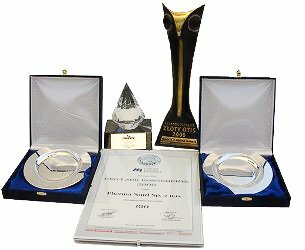 Over the years, Pharma Nord has received a number of honorary awards from both industrial and commercial organizations. Bio-Gluco Control: Best Vitamin and Mineral Supplement 2018, U.K.
Bio-Quinone Active Q10: Natural Healthcare Community Award 2015, U.K.
BioActive Q10: Best New Product 2010, U.K.